Our 3 bedroom condominium is located at beautiful Seascape golf/tennis resort. The family-oriented Seascape Resort is located around 3 lakes, 5 pools, tennis courts, and an 18 hole golf course. Security gates are located at each entrance and guest passes are issued at the office. Located on the second floor, the condo's deck overlooks the 13th fairway. One of the property pools is nearby for a convenient swim. The condo has carpet in the living room and bedrooms and tile in the kitchen, hall and bathrooms. Computer Wi-Fi is provided by the complex. Beautiful beaches are a walk away - some of the prettiest sugary white sand in the country! Set up your chairs and umbrella (rent or bring your own) near the Whale's Tail Restaurant located right on the beach - bathing suits welcome! Full-size washer and dryer is located in the breezeway just outside the condo's front door. CONTACT US IF YOU ARE INTERESTED IN A LONG-TERM WINTER RENTAL! WHILE IT'S COLD AT HOME, WE INVITE YOU TO STAY WHERE IT IS WARM - CONTACT US FOR GREAT RATES ON THE WINTER MONTHS. WE HAVE EVERYTHING YOU NEED FOR A COMFORTABLE WINTER! Cleaning fee is $125 paid directly to our cleaning people at the end of your stay. Contact us for rates. During the summer months we rent Saturday to Saturday. Holiday Weeks may have different price. We also run summer specials and reduce our weekly rate. Email your inquiry and we will send you pricing as soon as possible. Right beside condo. Get a guest pass from the main office in Ariel Dunes. Specific areas for grilling on the Seascape property. No grilling on decks/patios. Shaded private 2nd floor deck with outdoor table and chairs and a porch swing. Seascape is family friendly. It is a quiet resort nestled in the Destin/Sandestin area. Not only is it surrounded by a challenging 18 hole golf course, lakes and trees - but also it is just a walk away from the white sandy beaches and the beautiful gulf water. Once you stay here, you will see there is no other place like it in this area! This was our first time staying in Destin. We loved this condo and seascape resort. Very family friendly. Condo is very close to beach and pool. It is cozy and comfortable. Loved the back porch with the swing. Felt like being at home while at the beach. This was our fourth time staying in this condo and it was great as always. We love the short walk to the beach and having food and drinks at the Whale's Tail Beach Bar & Grill. The condo is fully furnished and very clean. We are already making plans for next year. I highly recommend it! This was our first visit to Destin and I have to say that we loved our stay at this condo. It is a great value for the price. 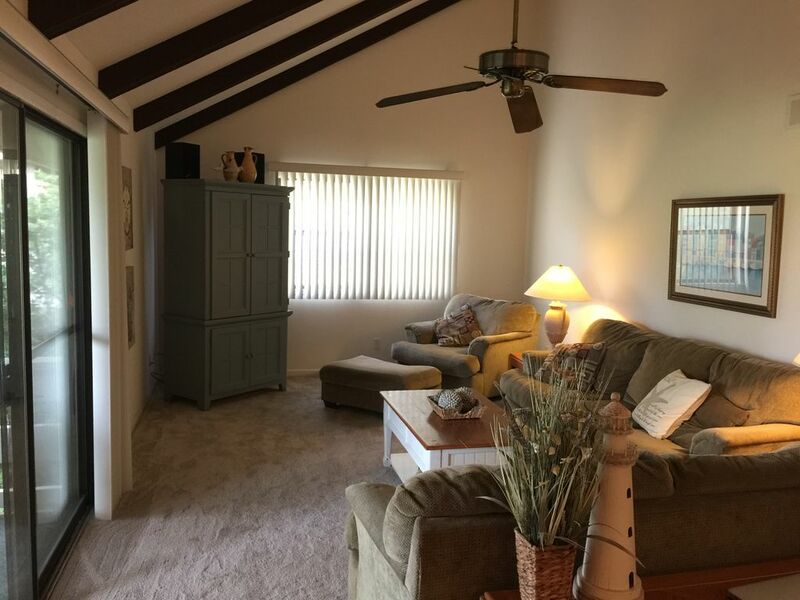 The beach is a short walk away and the property itself is very family friendly. It is also nice that there are several pools onsite. Everything was very conveniently located near and around the condo. We will certainly rent this place again if we ever make our way back to Destin. We have stayed in this condo twice, and have enjoyed ourselves both times. It is a fully equipped condo, very clean! Would stay again, and would highly recommend.Thank you! Great Condo, wonderful location, very short walk to the beach and very clean. We will stay here again.